A SWOT (Strengths, Weaknesses, Opportunities and Threats analysis can help your company face its greatest challenges and achieve success. Columnist Rob Enderle demonstrates how to use the SWOT framework by applying it to the two Republican presidential candidates. The upcoming presidential election is particularly fascinating to me because I’ve covered one of the folks running, Carly Fiorina. I even predicted she would fail in her attempt to move into public office due to some correctible shortcomings. These shortcomings largely resulted in her failure at one of the largest tech companies in the world, HP. Donald Trump isn’t in tech and I haven’t followed him as extensively. His use of social media has been brilliantly inspired, with some exceptions, but those exceptions point to why he too could fail in his political bid. Interestingly, the two folks’ strengths and weaknesses actually dovetail rather nicely and, if they’d listen to each other, together they could make an unstoppable team. But neither would accept being No. 2 so this will simply be a missed opportunity assuring both fail. A SWOT (Strengths, Weaknesses, Opportunities and Threats) analysis can show you where you need to focus (what is broken and not) and provide a more sure way to eventual success. Rather than products, let’s use the two Republican candidates I find most interesting, Carly Fiorina and Donald Trump, as an example of how to use SWOT. Strengths: Fiorina is strong strategically and can see where an effort needs to go long term. She is very strong as a public speaker, in Steve Jobs’ class, and is one of the strongest debaters, if not the strongest currently running for office. She worked her way up from secretary and has a good grasp of organizational politics. Weaknesses: She doesn’t take direction well from superiors, which was a big issue with the HP board. She is a credit hog taking from others and rarely if ever sharing it. She even removed the HP founders’ pictures and replaced them with her own pictures, which turned much of the rank and file of HP against her. This could make it impossible to build needed consensus for her indicatives and retain top staff. Her tenure at HP is perceived broadly as a failure even though it arguably was more successful than the majority of her successors suggesting the problem was more the board than the CEO. Opportunities: She is the only female candidate without political baggage and she is a strong believer in woman’s rights, suggesting she could bridge the Republican Party towards women. She has the ability to dominate a debate and as a woman can more easily physically represent a platform of change during a time when the U.S. electorate desperately wants that change. Threats: She isn’t good interpersonally and was soundly beaten in her negotiation with Steve Jobs on the iPod. Disloyalty by her staff is also an issue -- the betrayal by her then CMO is thought to have been the final straw that got her fired from HP after she eliminated other supporters. So Fiorina’s greatest threat is likely being blindsided by a trusted supporter who wasn’t properly nurtured along with her unwillingness to do something critical to her success she doesn’t want to do. Strengths: Also very good at thinking of his feet, he has created an impressive business power base largely leveraging financial resources belonging to others. Expert at gaming systems, he has taken to social media like a fish to water and tops all other candidates in new media management. A scary good negotiator with a powerful rolodex, he is likely one of the most powerful people in the world already. Weaknesses: Quick to anger and often speaking and texting before thinking, which makes him his own worst enemy. Doesn’t seem to be able to take direction from anyone, including close advisors with any regularity. Has an inferiority complex particularly when it comes to women causing him to overreact and exhibit obsessive behavior. Opportunities: Seen as someone who is outside the political norm he could pull from a broad cross section of voters who are upset with the status quo. Positioned properly his successes in negotiations and gaming systems would make him a strong player both nationally and internationally and his media skills would help ensure support from the electorate for actually fixing things like the VA, which has gone unfixed despite bipartisan support for decades. Threats: Trump is very tactical and can lose track of the strategic goal. His obsession with those who challenge him, particularly women, can make him look unacceptable for public office. His image is his greatest asset and yet he often sacrifices it to ineffectively attack those that aren’t real or lasting personal threats. In the end, Trump’s biggest threat is Trump. One of the interesting things about using SWOT for something like this is that it shows a potential for partnership. Trump could learn a lot from Fiorina’s preparation and her aggressive protection of her personal brand. Fiorina could learn from Trump how to more effectively use social media. She could also learn from his stronger negotiation and gaming-the-system skills. Both candidates are currently long shots for the job of U.S. President but they could improve their odds significantly by learning from each other and focusing more on fixing their weaknesses and threats, their strengths are likely already impressive enough. However, one of the things I’ve noticed about wealthy people is that they often refuse to see their weaknesses let fix them, which often speaks to why they fail, when they fail, in elections against people with fewer resources who are less skilled. 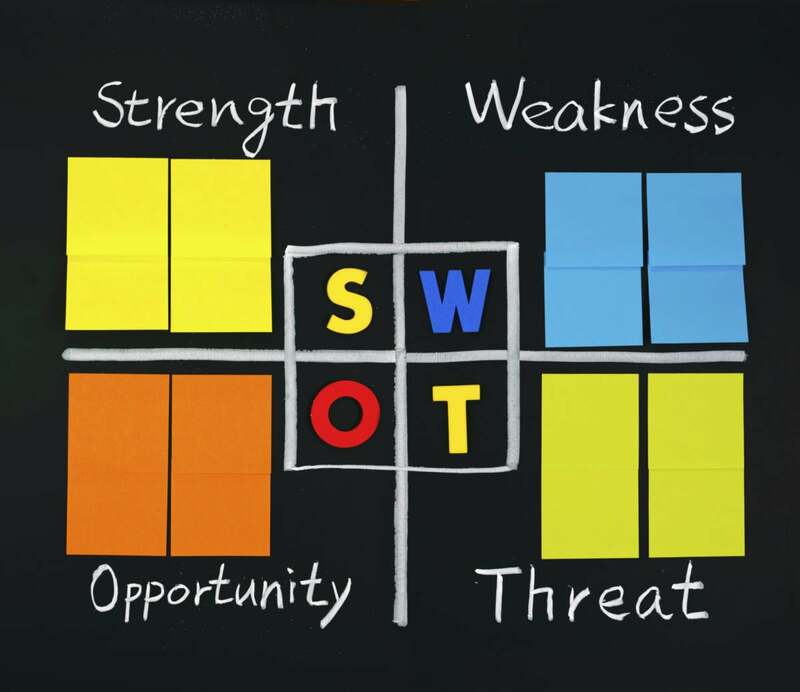 In the end, SWOT is a great way to work on fixing what needs to be fixed or to anticipate where a competitor or partner is likely to fail. Regardless of how you use it, SWOT is a powerful exercise that isn’t particularly hard to learn and can become an invaluable long-term skill if you take the time to learn it. Something to noodle on over the weekend.